NIMMONDIGE NAANU: Two wheeler drive! It’s been a little while, since Parliamentary elections are over. I moved around different wards in my Constituency in the early hours of this morning. It was at Rajajinagar 4th block, we all assembled together and kick started our drive on two wheelers. I met citizens at hotels, bus stops and many other public places. A pleasant surprise was evident on their faces with the kind of reception I got from them.. They were wondered at the sight of seeing a minister on two wheelers, although I myself am unfazed by the diplomacy of power. I want to remain so, anytime. It was a 4 hour sagacious journey through my area. 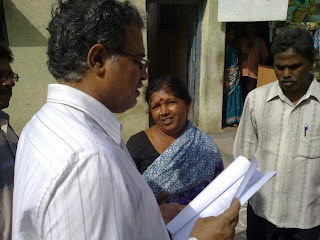 I inspected the ongoing works, spoke to the residents, sought their opinions, and heard their grievances. My friends ie., my fellow workers in the Party who accompanied me in this two wheeler drive were immensely happy with my company and wants me to make it a fortnightly affair! In fact, it’s always my deep rooted desire to come back to you time and again! 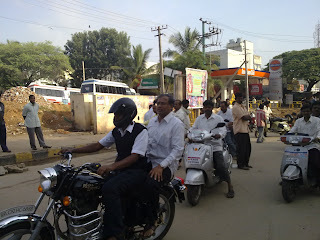 In the photograph that shows you as pillion on a motor bike your image is blurred, but what is prominently visible is a public toilet bang opposite. I do not think i need to give any explanation and it speaks a lot. I'm very happy to hear this news. we are willing to hear lot more News of development works. I have already told this... and I am reiterating this once more. The immediate concern in Prakashnagar Area is the Open Storm Water Drainage. The covering of this open Storm Water Drainage on top by cement moulding started near Varalaxmi Nursing Home, but thereafter a slow pace of work is going on and what BBMP is after NOW is not known. The stench emenating from it is awful and this poisons the whole atmosphere. No pure oxygen air is breezing through Prakashnagar, hence in a water-footing method the closing of this open storm water drainage should be undertaken. I happened to hear that a proposal is in the offing that the Storm Water drainage is to be completely left for flowing of rain water and the sewage will be made to flow in pipes running in the storm water drainage. If this work picks up then instead of closing the Storm Water Drainage it could be used as Park for morning walking of people and for children playing. Children already are suffering due to paucity of space for playing. A watch should also be kept that this does not become a dumping ground for debris and garbage. During rains the rain water should flow through this freely and during off-season it can become a play yard for children and for walking to elders.